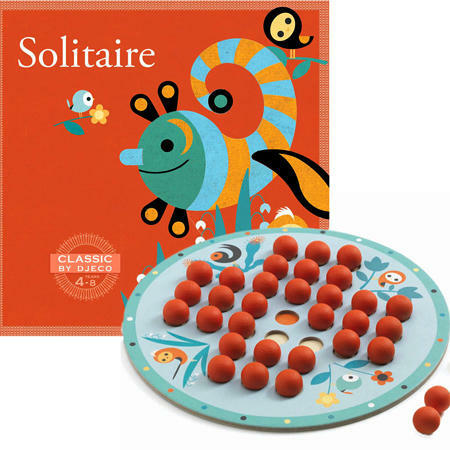 Solitaire Game Djeco is a traditional game which has been beautifully designed by french company Djeco. Solitaire is played by jumping a piece over another piece to land on an empty space on the other side. Pieces can only be jumped vertically or horizontally and you can only jump one piece at a time. You can, however, perform multiple jumps in succession, so long as each jump lands into an empty hole. The board of this game is made from very heavy duty card and the pieces are made from wood. We like this because: "Very absorbing game beautifully presented."